Check out the note we wrote about this same client’s bathroom design! Remember the bamboo bathroom cabinet that we worked on with our client? We suggested bamboo so that it would tie in with the bamboo floors. The problem was that… the bamboo floors were kind of random in themselves. See, we have cherry (?) in the kitchen and fir trimming the doors and windows, AND knotty pine on the vaulted ceilings upstairs and basement ceilings downstairs. Without replacing major elements, and painting out a bunch of gorgeous woodwork, how do we make all these different finishes work together? 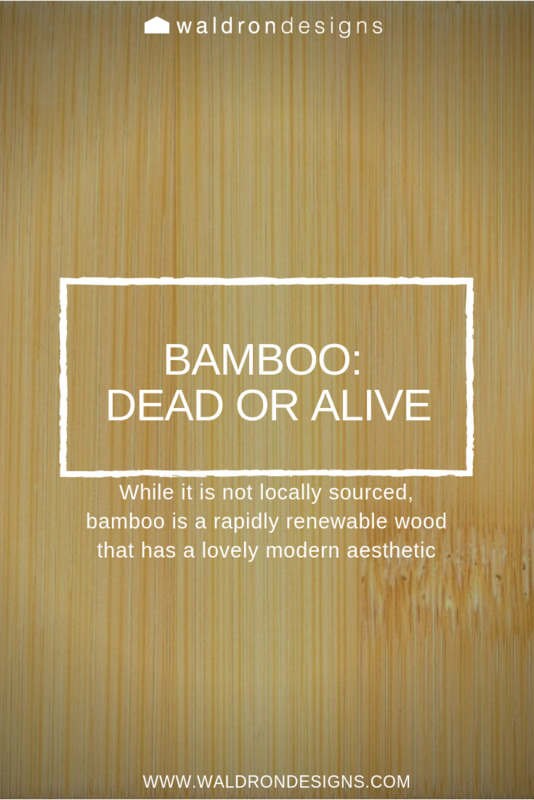 Since the bamboo is the out of place element here, but one we want to maintain, we are going to make the change here. Now, before I tell you what we are going to do, I want to say that there are certain trends I am not a fan of, but I am of the mindset that there is a place for everything and everything can be beautiful if done well. The suggestion I made for this project blew ME away. Ready for it? Why is this crazy? Well, not too long ago, my husband suggested we whitewash the wood paneling in our house. My response was to say that we should just carve a bunch of wood doilies and whitewash them and cover the wall, beause if we’re going granny style we should go all out. Sometimes my ideas surprise me by killing my initial perspective of the trend though, and this project is the perfect example. Whitewashing the bamboo removes allows the bamboo to serve as a more neutral element and differentiate itself further from the other woods. 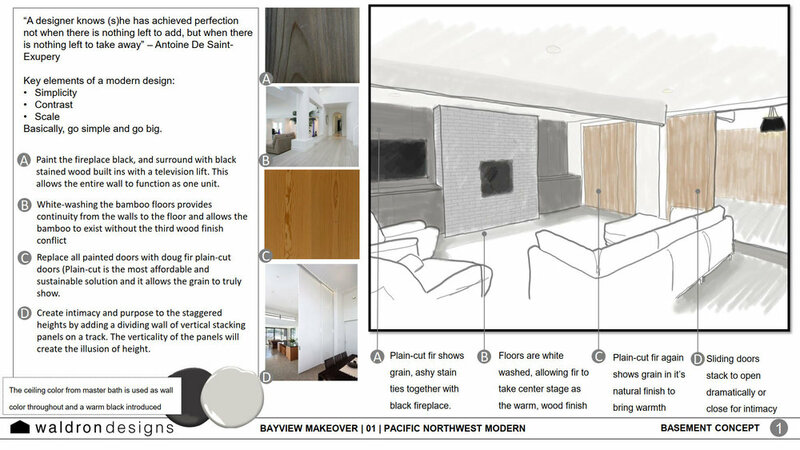 Furthermore, staining the wood dark on either side of the fireplace creates a more solid plane and creates a bridge between the natural wood and the whitewashed bamboo. I am pretty thrilled with this concept and can’t wait to see how it comes together. This design will likely be handed over to the contractor as a concept, not a fully fleshed out design, so there will be unknowns that will be fun to see how they come together.